When in 1970 Helen Gardner revised and re-edited F. P. Wilsons important essay Shakespeare and the New Bibliography (1942), she stated that this swan-song of the school of Pollard saluted the work of Alice Walker, and she went on to add that leadership passed to some extent in the 1950s across the Atlantic, mentioning Fredson Bowers and Charlton Hinman with their influential contributions (pp. ixx). 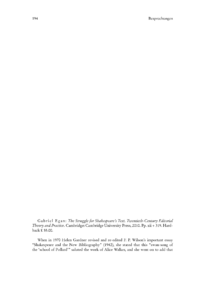 Gabriel Egan (who does not mention Gardner) attempts to offer what can be described as a continuation of Wilsons and Gardners narrative, rehearsing the progress of editorial theory and practice from the advent of the influential Cambridge Shakespeare (later Globe) to the latest theories on the relationship between printed and performed texts and the literary versus stage-oriented aspirations of Elizabethan playwrights and Shakespeare in particular.